TRAD TKO’s Andy Gatenby could barely hide the disappointment he felt, after learning that the highly anticipated clash with former British, Commonwealth and European Champ, Esham Pickering, on the Josh Goodwin (Goodwin Sports) promoted CHANGING OF THE GUARD event at the Pyramids Centre in Portsmouth on Saturday 20th September 2014, was off. However, Gatenby made it more than clear that the news, of Pickering’s pulling out, hasn’t dampened his excitement of fighting, against someone of equal stature as the former Champ, in front of a home crowd on September 20th. “Yeah, I’m delighted to be fighting in Portsmouth, my home town, yeah I’m really looking forward to be fighting in front of my home crowd again. I was supposed to be fighting Esham Pickering but found out the other day that he has pulled out. I was gutted about that, trained really, really hard for it, it was a big step up in opponent, it would have been an awesome win on my CV. So now he’s pulled out, we’re looking for a suitable replacement, someone of the same caliber. They’ve offered me a few people but their records weren’t very good so I turned them down, I’m looking for good opponents as I want to progress. 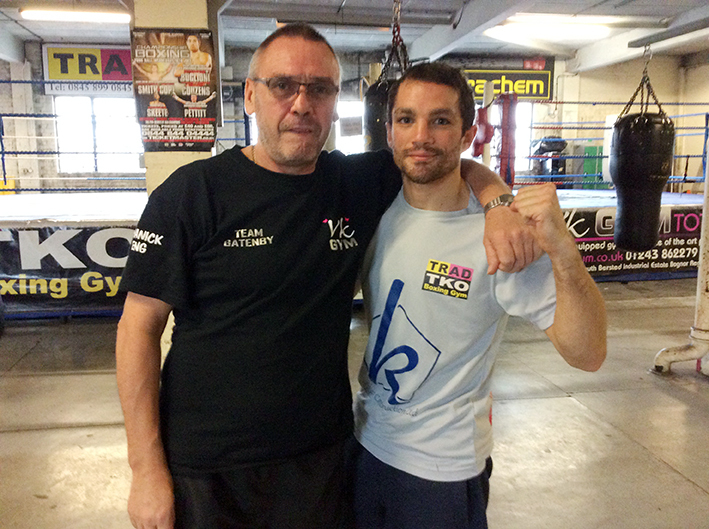 Training’s been going really well, been at Derry Matthews gym in Liverpool, working with John Murray. We’ve also been at Paddy’s Gym and Swindon, obviously been here at the TRAD TKO in London. It’s been a bit difficult as we are quite a distance apart, as John is in Liverpool, but it still seems to be working. I’ve been getting up and running at 5:30 every morning, coming back and leaving for work at half six, getting back from work at half six in the evening and gone straight for training, whether that is in Pompey or driving to Salisbury or Swindon, then John’s got me on a circuit first thing the next morning. I’ve even had it a bit more recently, because my wife Kirsty is on holiday, so I’ve got my little girl full time as well, so I’ve had to get a mate to sleep round, so I can go running in the morning, then I have to drop my little girl at Kirsty’s sisters and then go to work, then at night pick up my little girl, drop her off at home and then get someone round to look after her and only then get to go training. My little girl’s only three, so when I put her to bed I tend to go straight to bed afterwards. As you can see I’m determined to make this all work, I mean starting at 5:30 and finishing at eight every night, putting the hours in that’s for sure. When I knew it was Esham, this is the first time I’ve done this, trained for a particular fighter, even my screen saver was a photo of him, so I’d look at my phone everyday, see the photo of him, I was mentally preparing , every morning I would wake up to my alarm – the alarm name was ESHAM IS RUNNING – every morning I would wake up so tired, but soon as I see that photo I was straight up out of bed and ready to go running. Obviously I was a bit down when he pulled out but now I’ve cleared my head and focusing on the fight, don’t care who it is just want to get out there now with whoever they get for me. I have to say a big thank you to my fans, for getting behind ‘Team Gats’ they’ve been great supporting me and buying tickets, without you buying the tickets it would have been impossible for me to progress to this stage. Andy Gatenby, against a yet to be named opponent, features on the Josh Goodwin – Goodwin Sports – promoted CHANGING OF THE GUARD event at the Pyramids Centre in Portsmouth on Saturday 20th September 2014. Tickets, priced £30 (Standard) and £60 (Ringside) are available direct from Andy on 07767 830195.